It was another beautiful in paradise even though it started with rain about 4:30AM. Knowing Florida weather I was in hopes it didn’t rain a few blocks away at Freedom Lake Park. When I arrived at 8:00AM it was still wet and looked doubtful if we would get to skate. At 9:00AM we decided it wasn’t too wet and we would skate toward Ginny H place first to test the roads. They were dry enough to go the distance. We totaled 10 miles today and had 4 skates and 7 bikers. Chrissy O joined us for the first time today. Glennis W and Deborah B returned. 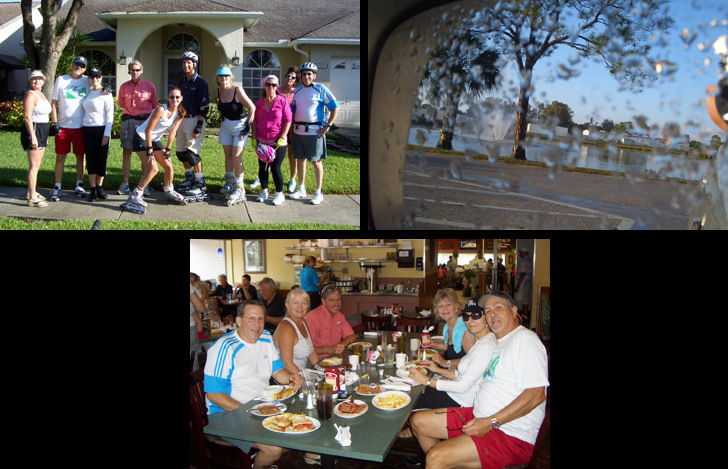 Breakfast today was at a new location for the Sunday Bladers. We tried Parkside Grill at 8180 49th St N. We weren’t disappointed. I called about 10 minutes before our arrival (it’s close to the skate) and our table was ready. The food was out in 20 minutes and everyone rated it from a 9.0 to a 9.5. I think it’s a keeper.